The Vanitek 25 Feet Fish Tape will make you easy to move or thread cables and Re-Wire through drywall, conduit or insulation. Simply guide the fish tape through the narrow opening, attach wires to the pulling loop and guide the wires to the new location smoothly and efficiently. It is housed in a sturdy carrying Reel case and is made from high-grade carbon steel for performance. 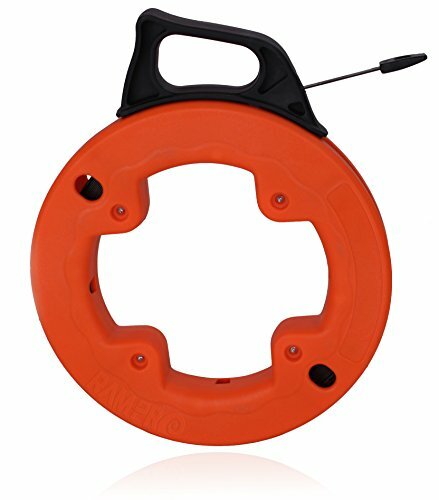 An easy reel out allows you to finish the job faster without straining your body. 1/8-Inch Wide 1/16 Inch Thick Steel 25 feet Long. • Save a lot of money by doing your own wiring. Even if you've never picked up an electrical tool in your life, you can safely rough-in wiring by using the Vanitek Steel Fish Tape Reel while running cable throughout the room, and making the electrical connections. • Built-in thumb lock holds the wire in place.